An employee confidentiality agreement is a contract in which two or more parties agree not to reveal the information that is covered by the agreement. A legal document which serves as a contract that binds between an employer and employee. Both should agree not to reveal the information of the company that should be kept as secret. The binding terms and conditions of the agreement forbid the employee from disclosing the company’s propriety and confidential form. You May also See Personal Confidentiality Agreements. This type of template is designed for contractors, employees, consultants, volunteers and other individuals that conduct business on a specific company. This document is very basic and with a clean layout that makes the contract easy-to-read, understandable yet professional. This contract covers the financial, private and personal information confidentiality agreement for the binding individuals. This type of template is designed for employees including faculty, staff, visitors, temps and etc. or even to the outside entities such as the contractors, consultants, vendors, agencies and etc. 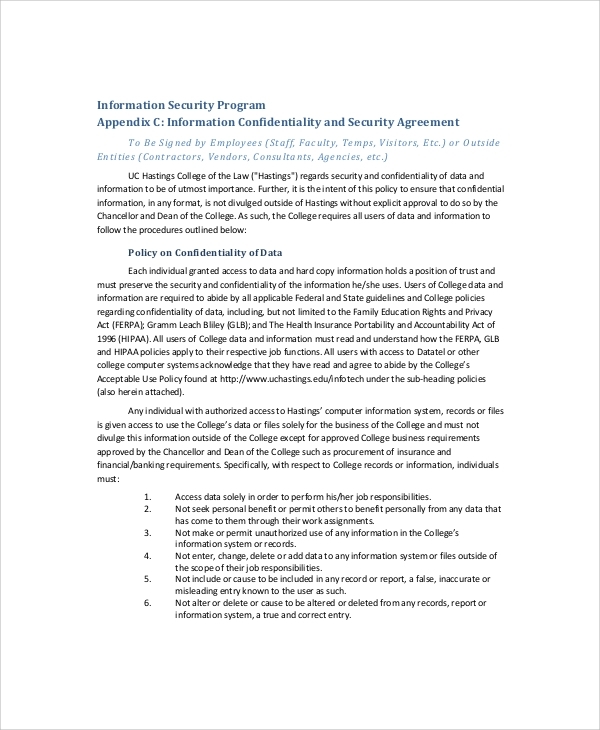 The document is all about information security program. The contract contains the confidentiality and security of information and data to be of paramount importance. This type of template is designed for an employee who signed an agreement of becoming aware on the company’s confidential information that consists of propriety business information or trade secrets including statistical information, data, processes, formulas, inventions, and techniques belonging and having a value of the company. All of these important information needs to be private and subject to non-disclosing. This type of template is designed for consultants. 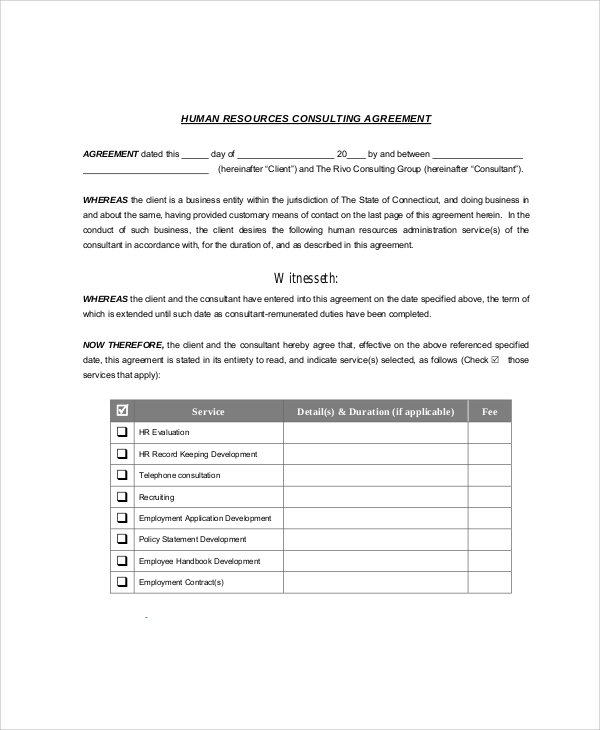 This document covered with the human resources consulting agreement. The document contains a written agreement that is detailed. The contract consists of the witnesses, recital, and terms. The agreement covered with background checks, confidential information, and indemnification and the limiting conditions of the company. There are a lot of uses and purposes on a non-disclosure agreement. A company makes use of the agreement to maintain the secrecy of data and information. 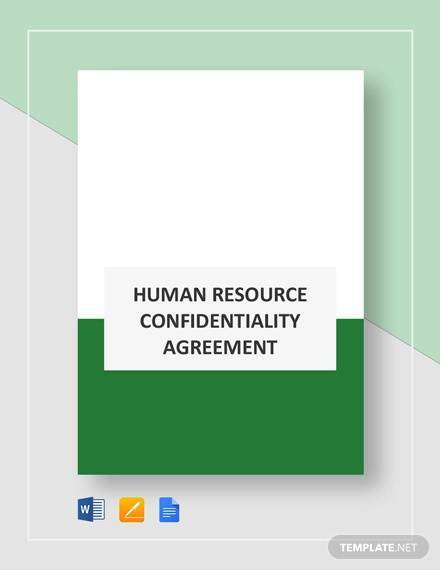 HR confidentiality agreement uses to protect the company’s data and information. Information is the ultimate valuable asset that a business can have. It is vital for a business to have control on its access, to use as contractual agreements in protecting itself against unofficial disclosure. When do I need an HR Confidentiality Agreement Sample? 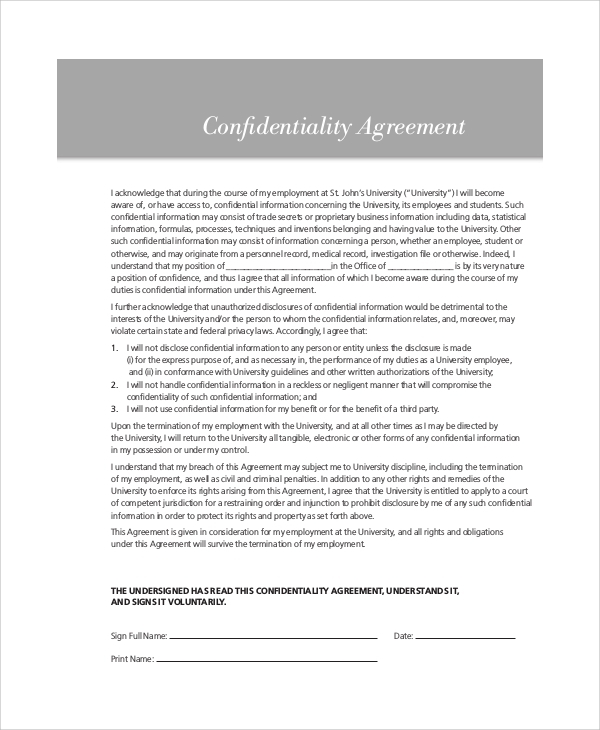 A business company needs a confidentiality agreement form to be provided to the employees for signing. All companies need to protect and shield confidential information and data. There is business information that needs non-disclosure, thus an agreement binds the employees and employer to keep the confidentiality. Once an applicant becomes an employee of a particular company, it is expected that she/he should sign a legal contract to agree the company’s terms and conditions regarding trade secrets. Once an employer hired an applicant, an employee is obliged and responsible for his/her act within the company’s operations. After an employee is being hired, he/she needs the agreement for signing as well as the employer to provide the document for the employee. 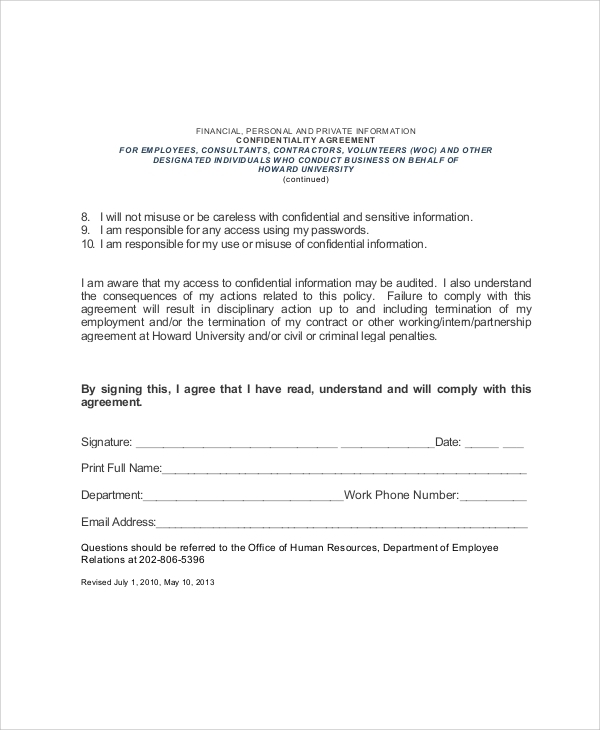 How to create/write an HR Confidentiality Agreement Sample? Writing an HR confidentiality agreement needs to be informative and imperative. Since this is a legal contract as one of the most important documents that a company must have, it must be written in an authoritative form yet simple, understandable and professional. You have to give the definition of the confidential information, be specific on the confidential agreements either one-sided or two-sided, the content must include the number of provisions and take note that Staff Confidentiality Agreement is often paired with non-compete agreements. For the finalization of the agreement, both parties involved in the agreement should sign with the effective data. The confidential disclosure agreement is available for free. It comes with word doc and PDF files. It depends on the preference of file to be use and download. The files offered are free, downloadable and printable. 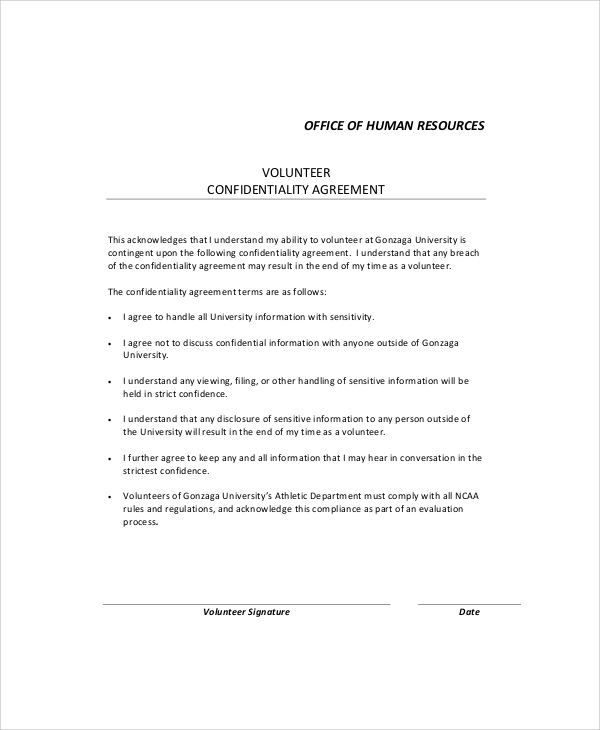 Simply look for HR confidentiality agreement sample for further information about the file.